The present study aims to isolate the bacterial community from different organs (stolons and utricles) of U. breviscapa, which may have great biotechnological potential, in order to build the first bacterium collection for U. breviscapa and study the diversity of cultivable bacteria, aiming to understand their function in this unique environment. The samples of U. breviscapa plants were collected from two different floodplains in Brazil: (1) Santo Antônio de Leverger municipality, Mato Grosso state (MT) and (2) Rio Tietê flood plain, Mogi das Cruzes municipality, São Paulo state (SP) (Table 1 and Fig. 1). The sample plants were stored in plastic bags duly identified with sample number and the point from which they were collected, maintained in freshwater at environmental temperature. After collection, the samples were transported to the Laboratory of Molecular Biology and Microbial Ecology where the isolation was immediately carried out. Vouchers are deposited in Herbarium HUMC. 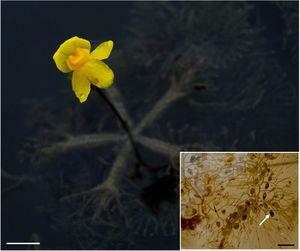 Habit of Utricularia breviscapa with inflorescence (bar=10mm). The detail shows a stolon with utricles (arrow indicates an utricule; bar=5mm). The maceration method was adapted from Kuklinsky-Sobral et al.20 for the bacterial isolation from weighed stolons and utricles of U. breviscapa previously washed in sterilized water. Bacteria were isolated by soaking 5 stolon fragments (approximately 5mm per fragment) or 10 utricles in phosphate-buffered saline (PBS) containing Na2HPO4 (1.44gL−1), KH2PO4 (0.24gL−1), KCl (0.20gL−1), and NaCl (8.00gL−1), adjusting the pH to 7.4, and macerating. After maceration, the sample volume was adjusted to 1mL, appropriate dilutions were carried out and plated onto 10% trypticase soy agar (TSA) supplemented with 50mgmL−1 of the fungicide Imazalil (Magnate 500 CE, Agricur), and the plates were incubated at 28°C for 2–15 days. The colonies were removed from the plates, inoculated onto 10% TSA agar medium, incubated at 28°C for 2–10 days, and then each isolate was suspended in a 20% glycerol solution and stored at −70°C. Statistical analyses were carried out with biological triplicates for each treatment for bacterial quantification in the isolation experiments, which were performed in a completely random design. The significance of the observed differences was verified using a new analysis of variance (p=0.05). Analyses were conducted using R software version 3.0.1. After cultivation, the bacterial DNA was extracted according to Araújo et al.21. A partial sequence of the 16S rRNA gene was amplified using the pair of primers R137822 and P027F.23 PCRs were performed according to Dourado et al.24 All PCR amplification was checked through electrophoresis on agarose gel (1.5%, w/v agarose) and UV visualization of the ethidium bromide-stained gels, after which the PCR products were purified using a GFX PCR DNA and gel band purification kit (Amersham Biosciences) and sequenced by Sanger Sequencing Technology25 using the primer 1378R. A total of 200 DNA sequences of partial 16S rRNA genes were deposited in the GenBank database under accession numbers KY453794 to KY453980. A total of 200 sequences were obtained from bacteria isolated from U. breviscapa. Higher isolated bacterial density was observed in association with plants from Mato Grosso (MT) (Fig. 2). The bacterial density averages from MT samples were 4.9×105CFUutricle−1 and 3.6×107CFUg of stolon−1, while the samples from São Paulo (SP) had bacterial densities of 6.0×104CFUutricle−1 and 1.2×107CFUg of stolon−1 (Fig. 2). Bacterial density in (A) utricles and (B) stolons of U. breviscapa from Mato Grosso (MT) and São Paulo (SP). Statistically different at p<0.05. The richness estimator of OTUs performed with the Chao1 and Ace indexes at 97% (Table 2) showed a greater bacterial richness in SP plants than in MT plants. According to the Chao1 parameter, we can observe the highest richness in utricles followed by stolons in SP plants. However, based on the Ace estimator, the opposite was observed, in which the Ace index showed the highest richness in stolons followed by utricles. In terms of bacterial richness in MT plants, Chao1 estimates a statistically equal richness in both utricles and stolons (Table 2). Diversity index and richness estimation of analyzed OTUs. It is common knowledge that the performance of non-parametric estimators depends on the species abundance distribution in the sample, and the preference for one over another is a difficult issue. Basualdo31 observed in his work that the Ace index was better when the observed richness was low and Chao1 when the observed richness was high. In another study, Hortal et al.32 mentioned that abundance-based non-parametric estimators (Ace and Chao1) are more precise compared with other richness estimators; however, their precision diminishes at lower sampling intensities, producing less consistent results. This suggests that the choice among richness estimator parameters can vary between sampling characteristics, even in the same study. According to the Simpson index diversity at 97%, a higher diversity of OTUs was found in libraries constructed from SP plants, with the highest diversity in stolons (stolSP) followed by utricles (utricSP). Similar to São Paulo, the bacterial diversity index in MT plants was also higher in stolons (stolMT) followed by utricles (utricMT). The Shannon diversity index at 97% showed the same result. The Libshuff significance test indicated that those libraries belonging to the same part of the plant (stolSP/stolMT and utricSP/utricMT) (Table 3) differ significantly for each sampled site (São Paulo and Mato Grosso). 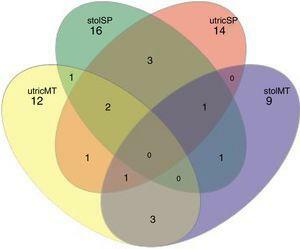 Moreover, although they are associated with the same site, the significance analysis for utricleMT and stolonMT shows a significant difference between these parts of the host plant. On the other hand, when comparing utricleSP and stolonSP, which present higher richness and diversity in their 16S rDNA libraries, do not vary, indicating that only in less diverse environments are there different colonization patterns between stolons and utricles. Libshuff analysis comparing coverage between libraries. 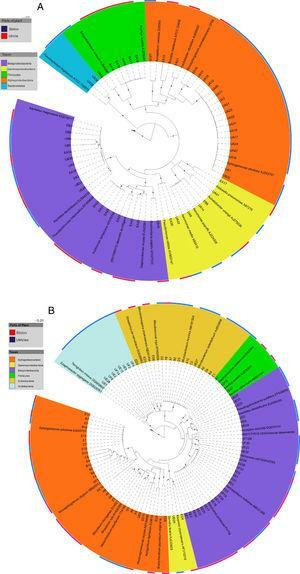 A dendrogram of bacterial communities showed similarities between the same site libraries (Fig. 3). Agreeing with the richness and diversity indexes, the libraries were grouped according to the sampled site, grouping utricles and stolons from São Paulo (utricSP and stolSP) in the same branch (with presents higher diversity), while utricles and stolons from Mato Grosso (utricMT and stolMT) were grouped in another branch (which presents lower diversity). This indicates that there is greater bacterial community similarity between different parts of the same host plant collected from the same sampled site (São Paulo or Mato Grosso), corroborating the hypothesis that the place of origin plays the main role in bacteria-plant interactions, since the environment supplies the microbial diversity to the plant host. 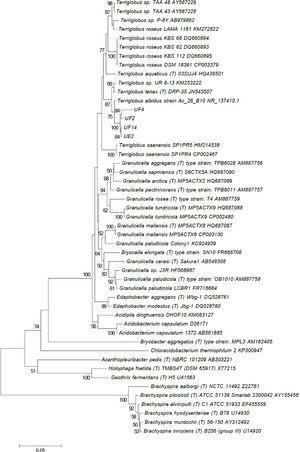 Dendrogram of bacterial communities associated to U. breviscapa. In looking at the 200 isolates from SP and MT, respectively, the 16S rRNA analysis of plant isolates from MT showed 22 bacterial genera, among them Sphingomonas (36.71%), Aquitalea (18.99%) and Bacillus (6.33%), while in the plant isolates from São Paulo, we found 31 bacterial genera, of which the predominant genera were Microbacterium (20.66%), Sphingomonas (14.05%) and Pelomonas (9.09%) (Fig. 4). Caravieri et al.18 also found Sphingomonas and Microbacterium genera in association with U. hydrocarpa, but the culture-independent methods used in their work found these OTUs among the less abundant genera. Phenetic trees representing the cultivable bacterial found in utricles and stolons from U. breviscapa were built using Neighbor Joining method in MEGA 5 software. (A) Isolates from Mato Grosso and (B) from São Paulo. The solid gray circles next to the tree branches correspond to bootstrap values higher than 50%. Brachyspira innocens (S000437178); Brachyspira hyodysenteriae (S000437188), Brachyspira hyodysenteriae (S000437188) and Brachyspira hyodysenteriae (S000437188) was used as outgroup. Six genera were common to both sampled sites (SP and MT): Aquitalea, Azospirillum, Bacillus, Chromobacterium, Novosphingobium and Sphingomonas (Figs. 4 and 5). As shown for bacterial density, it was also verified that the abundance of cultivable bacterial species varied according to the sampled sites, suggesting that the plant selects the bacterial community in its tissues, and this selection must occur from the diversity present in its surrounding environment. Moreover, Koopman et al.39 observed that the bacterial community within the traps of Sarracenia alata plants was significantly different from the soil surrounding the plant and varied over time, suggesting that the community associated with the plants should not occur randomly but should be dependent on the interaction between the plant genotype and the environmental conditions. Venn diagram represented by shared UTO's of stolons (stol) and utricules (utric) of U. breviscapa from Mato Grosso (MT) and São Paulo (SP) (dissimilarity of 0.09). Therefore: utricMT: utricules from Mato Grosso, stolSP: stolons from São Paulo, utricSP: utricules from São Paulo and stolMT: stolons from Mato Grosso. Furthermore, SP plants presented exclusive groups, such as the Actinobacteria that were isolated from stolons and utricles, confirming the specificity dependent on the geographic location from which the plants were collected. However, despite presenting similar libraries with no difference in the Libshuff significance test, plant organs can also select a bacterial group, such as the phyla Acidobacteria and Bacteroidetes, which were found only in utricles from plants collected in São Paulo and Mato Grosso, respectively (Fig. 4). These results support the hypothesis that plants select the bacterial communities associated with stolons and utricles based on the available community present in their surrounding environment. Another important point we need to address is the utricle isolates that belong to the Acidobacteria group, identified as the genus Terriglobus albidus (99% similarity), a genus of fastidious growth (Fig. 6). Phylum Acidobacteria is one of the most abundant in soils, and its members have been found by cultivation independent methods in many types of environments. Acidobacteria is known to be abundant in trap fluid, and some species are known to live in acidic environments.53 Sirová et al.17 showed that the trap fluid pH is low in U. vulgaris, ranging from pH 4.2 to 5.1 according to the trap age, and this could be correlated with the phosphatase activity inside the trap. Phenetic tree representing the cultivable Acidobacteria found in association with utricles of U. breviscapa from SP using Neighbor Joining method in MEGA 5 software. Numbers above the branches indicates bootstrap values. Brachyspira species were used as outgroup. However, members of the Acidobacteria group have proven difficult to isolate and cultivate under laboratory conditions, and there are still few species with valid names, and few are well defined; among them are members of the genera Acidobacterium, Acanthopleuribacter, Bryobacter, Edaphobacter, Geothrix, Granulicella, Holophaga and Terriglobus.54,55Terriglobus sp. was previously isolated from water56 and from specific soil conditions, such as desert soils,57 arctic tundra soils58 and the rhizosphere of a medicinal plant.59T. albidus was described in 201560 isolated from a semiarid savannah soil collected in northern Namibia, however the present work present the first report of cultivable bacteria belonging to this genus isolated in association with a carnivorous plant. Caravieri et al.,18 using culture-independent methods, reported that Acidobacterium was one of the dominant genera in association with U. hydrocarpa. There are advantages in retrieving an Acidobacterium isolate due to its biotechnological applications, such as the production of an extracellular matrix that apparently facilitates the flocculation of cells in liquid media.61 Therefore, our research group is currently investigating the biotechnological potential of these Acidobacterium isolates. The results show that the bacterial diversity of U. breviscapa varied according to the isolation location (São Paulo and Mato Grosso) rather than organs. This is also the first report of an Acidobacteria (Terriglobus genus) isolated in association with utricles of U. breviscapa. The role of these bacteria inside the utricles and stolons must be further investigated in order to understand their population dynamics within the host plant.